What pickup setting do I use on the new GR-55? find out what is causing the issue? 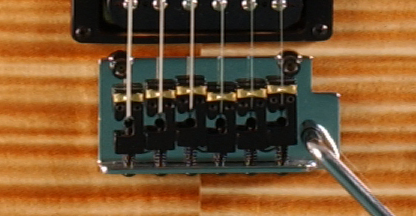 RMC piezos have a gold element that the string sits on like the picture below. Graphtech piezos have a black saddles/elements that the string sits on like the picture below. You can see other types of Graphtech piezo examples on our Graphtech upgrade page. We suggest you watch the Roland Product Support video for exact settings and set up instructions, see video below. If you are still having difficulty, follow the steps below. It is important to first determine what is causing your issue, ie; guitar, synth, other devices, etc. There are few steps you can take to isolate. We suggest you reset the factory default setting on your synth unit, sometimes this device can have a bad setting and alter pitch or have erroneous data stored that can cause tracking issues. We suggest, if possible, to try another "known good" 13 pin guitar on your setup, to determine if it is the guitar of synth. Do you still have the issue with a different guitar? We suggest, if possible, try your iGuitar on a "known good" synth at your local music store to see if the issue follows the guitar. Does it still fail or work properly? We recommend these step so we can be 100% sure it is the guitar before it is sent to shop for repair. Many times we receive a guitar back and it is fine, the problem was with the synth, a cable of something else within the setup. So again, we suggest you isolate and be sure it is the guitar before request to send ti in for repair.